Sept. 15, 2011: The existence of a world with a double sunset, as portrayed in the film Star Wars more than 30 years ago, is now scientific fact. 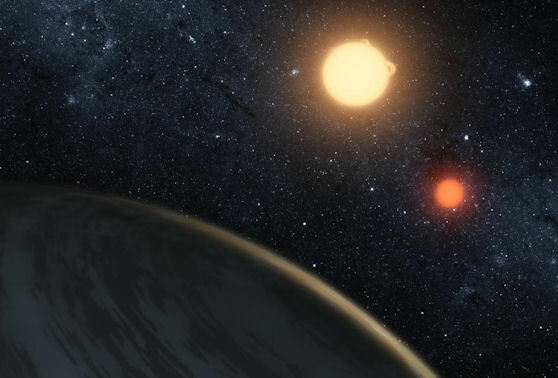 NASA's Kepler mission has made the first unambiguous detection of a circumbinary planet -- a planet orbiting two stars -- 200 light-years from Earth. An artist's concept of Kepler-16b, the first planet known to definitively orbit two stars -- what's called a circumbinary planet. The planet, which can be seen in the foreground, was discovered by NASA's Kepler mission.